CMS Window Systems has won a Vision in Business for the Environment of Scotland (VIBES) Award for its sustainable doors and windows and environmental best practice. Developed to recognise and commend the efforts of Scottish companies in reducing their environmental impact, the VIBES Awards aims to encourage efficient use of resources. For 2015, it shortlisted companies which have worked to increase their sustainability over the past decade. CMS Window Systems – which manufactures and installs aluminum, PVCu and timber composite curtain walling systems, doors and windows – has experienced previous success in the VIBES Management SME category; it won the award for the first time in 2009. 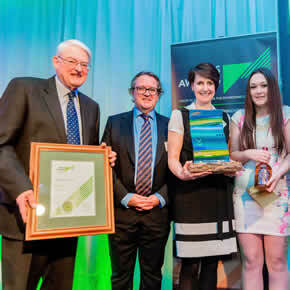 The company was praised for its commitment to continually reviewing and enhancing its performance, and for prioritising environmental best practice in recycling and energy efficiency. Operating from a manufacturing and recycling facility at Castlecary, CMS has recently opened its Innovation Hub, which is dedicated to the successful delivery of sustainable buildings and homes. Combining conference, seminar and meeting spaces with a showroom and exhibition area, the Hub can be used by any independent organisation within the housing and building sector. The showroom also provides a showcase for CMS’ existing range of sustainable doors and windows.